Former conservative party leader Hong Joon-pyo has announced his bid for leadership of the Liberty Korea Party, ramping up competition in the race. “I will run (for the party’s leadership), and it is right for me to do so. I have never seen an administration fall this fast. Only I can counter the current government,” Hong said during a publication event for his biography in Yeouido, western Seoul. While declaring his bid at the event, Hong took a personal approach by giving a brief overview of his life. Describing the past 65 years of his life as “tumultuous,” Hong said he overcame difficulties and served as a just prosecutor before entering politics. 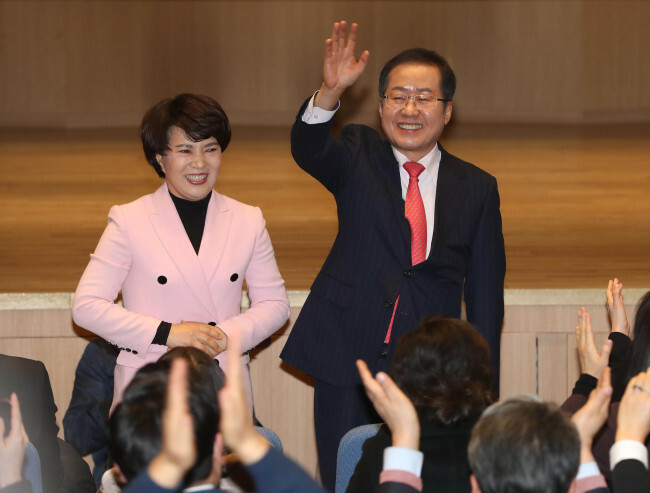 Hong’s rivals include former Prime Minister Hwang Kyo-ahn, who declared his candidacy earlier this week, and ex-Seoul Mayor Oh Sae-hoon, for the coveted post widely viewed as the ticket to the party’s primary for the 2022 presidential election. The Liberty Korea Party’s national convention is scheduled for Feb. 27. Emphasizing his role as a former party leader in breaking the conservative party’s links to ousted President Park Geun-hye -- who had long been a part of the party -- Hong criticized Hwang’s candidacy as a move that would revert the party. As the Liberty Korea Party’s candidate, Hong had also competed in the 19th presidential election with then-candidate Moon Jae-in. Hong had stepped down as the party’s leader last summer after the party’s crushing defeat in the June 13 local elections. He had taken a break from politics in the US. Since his return to Korea last September, Hong has communicated with core supporters and conveyed his thoughts on a wide range of issues through his YouTube channel TV Hongka Cola, which has roughly 240,000 subscribers. Kim Byong-joon, chairman of the Liberty Korea Party’s emergency committee, had filled Hong’s vacancy.